It is so good to spend a calm night at anchor in a hidden bay at the end of the world, deep in Rijpfjord on the north side of Nordaustland! Good prospects for tomorrow, as some of us were planning a pretty serious hike in Rijpdalen. As tomorrow had become today, the clouds where, however, hanging rather low, unfortunately. Hiking for hours on end in fog in unknown terrain and polar bear country was clearly not an option, so we went on a good and still pretty solid hike of 5 hours in lower Rijpdalen. What a beautiful country at the end of the world! 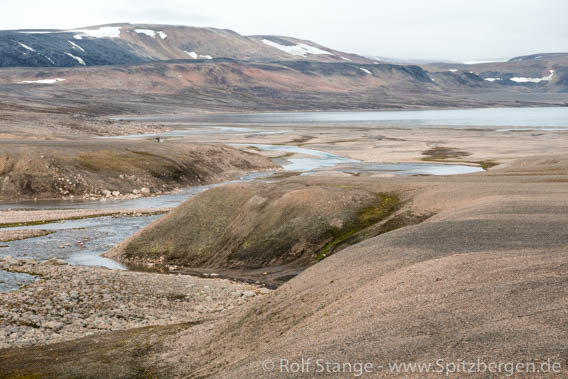 Very wide-open, surprisingly rich tundra, a wild river … the huge ice caps were looming behind the clouds, but visible here and there, Austfonna in the east and Vestfonna in the west. We found something that may have been a grave of unknown origin and the site where Henry Rudi, who later became famous as the „polar bear king“, wintered in the 1930s. They removed the hut the following year and took the materials down to Halvmåneøya, so nothing is left of it on site. 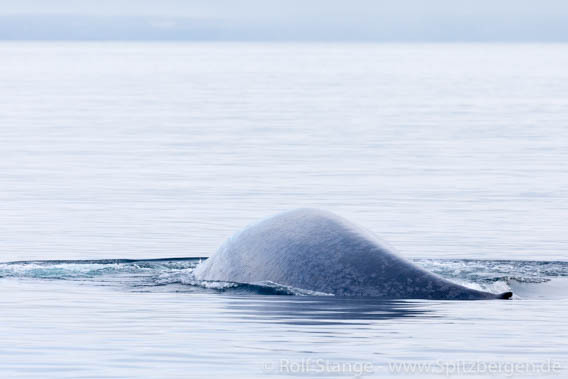 The days are flying by and we have to move west again, so now we are steaming towards Hinlopen Strait, not without saying hello again to yesterday’s Blue whales.